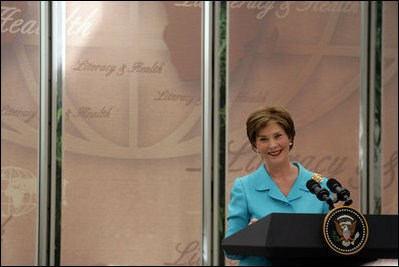 Mrs. Laura Bush speaks during a luncheon on global health and literacy Tuesday, Sept. 24, 2007, at the Pierpont Morgan Library in New York. "Over the last five years, Afghanistan's primary-school enrollment rate has increased by more than 500 percent. At the same time, Afghanistan's infant and child mortality rate has dropped nearly 20 percent," said Mrs. Bush citing an important example of how education and children's health are intertwined. "Just a few years of increased school enrollment have produced these promising advances in children's health."